"braids are the big thing in hair this season; love them or hate them, you'll be seeing lots of them around"..
Once you see a few A-list actresses and models sporting braids in their hair, you know it won't be long before this look becomes a fashion must. 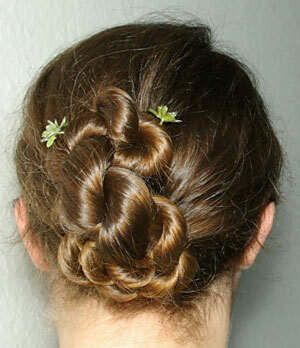 Yes, braids are the big thing in hair this season; so, love them or hate them, you'll be seeing lots of them around. Braids in 2010 take on a modern twist because, today, they are an essential part of the look without being the entire hairstyle. For example, the big thing this year is to have the braid replace the accessory, like the hair band, and have the rest of your hair fall in loose locks around it. The elimination of the bangs in the form of a braid across the crown of the head is really the big story but braids have many functions and can be worn in many ways. For example, braids assembled like a "rope" ponytail at the top of the head is also very much "in" this season as are braids in a "Heidi" like style where all the hair is braided and assembled in a wreath around the entire head. Braids are not new in the world of high fashion nor in the wedding world; so, the proper presentation is key in making the look perfect for 2010. Advantages to including braids in your bridal hairstyle?